Apple's iPad 2 launches this Friday, but the first reviews are starting to trickle in. Apple typically supplies pre-release hardware to certain organizations for early review. Here are the early reviews, with some key findings. - "Pick up an iPad 2 after handling an original iPad, and you'll notice the difference right away. This is a lighter, thinner device." - "The iPad 2 also has 512MB of RAM--twice that of the original iPad--and a 200MHz bus speed, likewise twice that of the original." - "Though the iPad 2 is an improvement on the original iPad in numerous ways, its still an evolutionary product, not a revolutionary one"
- "In short, the iPad 2 is the fastest iOS device ever made, by a long shot." - Battery life not as strong as first iPad, but impressive. - "It never crashed in my tests, unlike every Android tablet I've tested." - "As of now, I can comfortably recommend it as the best tablet for average consumers." - "iPad 2 managed an astonishing 10 hours and 26 minutes of non-stop playback" -- better than iPad 1 in their testing. - GarageBand is a "groundbreaking piece of software for tablets"
- "The iPad 2 isn't just the best tablet on the market, it feels like the only tablet on the market"
- "My friends, I'm telling you: just that much improvement in thinness, weight and speed transforms the experience. " - "We were able to software decode a side loaded 1.4GB .avi file in OPlayer on the fly, while watching it, without and lag or stutter. The same clip in the same app on the original iPad loads slower and drops frames and audio during playback." 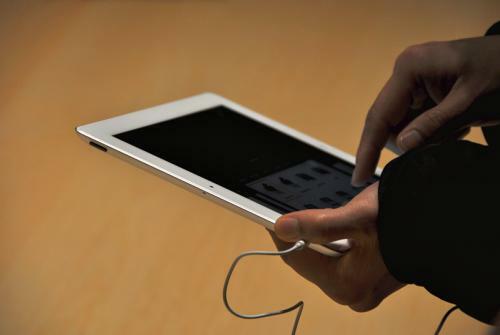 Apple has posted guided tour videos showcasing the iPad 2 and the new apps including Garageband and iMovie.